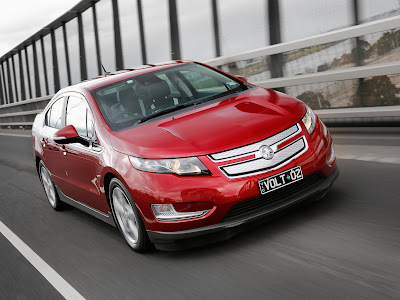 General Motors Holden were generous enough to recently loan EV News a Holden Volt for a week. On sale in Australia since November 2012, the Holden Volt is a right hand drive version of the Chevy Volt minus a few features like OnStar and the RemoteLink mobile app. The Volt has the same sized battery (16 kWh) as the all electric Mitsubishi iMiEV but because the Volt is a much larger car, carries around the weight of a 1.4 Lt petrol engine and as a result weighs 70% more than the iMiEV (1,080 kg Vs 1,715 kg) it falls short of the iMiEV's 150 km battery range. 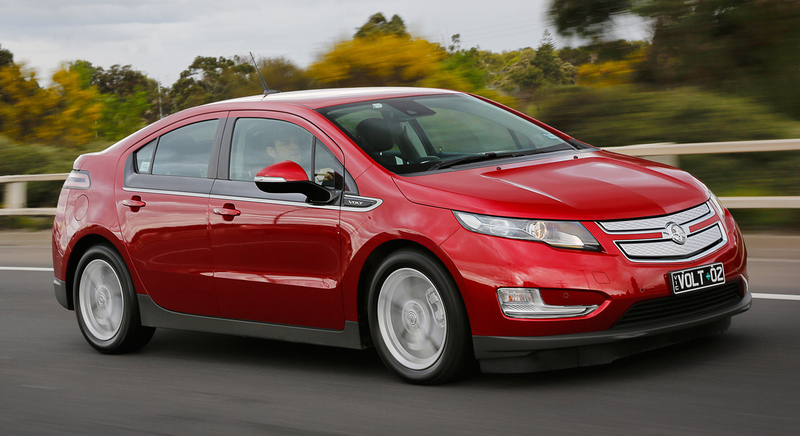 The Volt routinely achieves 70 - 80 km from a full charge in EV mode out of a total combined range of 600 km. Having now driven a couple thousand kilometres in the Holden plug-in hybrid, I've noticed the Voltec powertrain has more acceleration power in charge-sustain mode (114 kw / 155 hp) than the maximum available in EV mode (107 kw / 145 hp). While 150 horsepower doesn't sound like much, when combined with more torque than a 3.5 Lt Commodore V6 (370 Nm) multiplied by the 7:1 reduction gear ratio, the Volt has impressive mid range acceleration. The Voltec powertrain has four modes of operation so that with a depleted battery & under heavy load the 54 kw ICE / generator combines with the 111 kw main traction motor to provide extra power on demand. The Cruze based Holden Volt is the best handling FWD car I've ever driven. The low mid-mounted weight of the battery pack balances out the usual understeer inducing front heaviness of most transverse engined front wheel drive cars. GM's engineers have done a great job on the suspension. The ride is a fraction on the soft side but the weight of the car is only mildly noticeable on 'choppy' road surfaces. The electric power steering is perfectly weighted and because power assistance 'turns-off' when steering straight ahead it has a self-centering effect which requires minimal input and makes the car very relaxing to drive. The Volt's primary braking system is regeneration using the 3 phase BLDC traction motor. The legacy hydraulic friction brakes are only sometimes required below 5 km/h to bring the car to a stop. Brake pad and disc rotor wear should be so low that, like many Prius owners have discovered, brake pads on hybrids last up to 320,000 kms. As a result, the days are definitely numbered for brake pad manufacturers. In fact, given the constantly increasing market share of hybrids, the entire hydraulic brake system is rapidly becoming redundant and is well on it's way towards obsolescence (to be replaced by Wheel Motors?). The brake system blends in regenerative and hydraulic braking forces depending upon driving conditions. Due to the brake-by-wire nature of the system, pedal feel on the Volt is slightly different to "regular" brakes. During normal driving there is no direct hydraulic connection between the brake pedal and the brake calipers. Instead the Volt has a "pedal feel simulator" that "fakes" hydraulic feedback pressure while isolating the master cylinder from the brake calipers with solenoid operated valves during brake regeneration. Brake operation at parking speeds can feel a bit 'notchy'. A little green ball on the drivers dash display indicates every time the brakes are applied too heavily i.e. any time the friction brakes are used. The Green ball turns into a sun-like fireball indicating that using anything other than regeneration to slow the vehicle is considered 'inefficient'. In operation the regen brakes are the single best feature of the Volt. After just a couple of days I found myself either one pedal driving using the 'L' position on the gear lever to increase regen when required or no pedal driving, alternating between the cruise control and the gear lever depending on the severity of road undulations. It is possible to maximize regeneration using the brake pedal but that requires 'riding' the brakes to get the same effect as using 'L' on the gear lever. I've never driven a car that requires the use of cruise control to stop it slowing down too much. In 'Low' gear, the Volt's regeneration is maximised to save more energy to the battery to extend the vehicles range. Brake regeneration in 'Low gear' is so strong that it continuously decelerates the car even on the steepest downhill grades (including the infamous Mt Ousley) so cruise control needs to be engaged to maintain a minimum highway speed to prevent the car from grinding to a halt. Hairpin bends are a delight in the Volt. While 'no pedal' driving, on approach to a tight corner or hairpin bend you simply cancel the cruise control and the car automatically starts braking for the corner. The trick is learning how 'late' to do this as the regen braking effect is so strong you'll initially find yourself braking much too early and having to accelerate again to reach the corner apex. EV News tested the Volt along the Putty Road just out of Sydney which contains several sections of 45 & 35 km hairpin corners. Once we got a handle on the 'late' braking required it was fairly easy to take even the tightest corners without brake pedal input. The only time the friction brakes were applied was when we noticed a warning light on the dashboard indicating the car had triggered the stability control a few times due to the lateral Gs around the hairpin bends. Overall the Volt is a brilliantly executed example of automotive innovation that makes any ICE only car seem primitive by comparison. It combines the benefits of a full EV powertrain with a part-time duty-cycle ICE to provide 600 km of combined range. Where the Toyota Prius is an ICE powered car with electric assistance, the Holden Volt is a plug-in electric car with ICE assistance.